Wok-fried lobster in broth with crispy and steamed rice, fish ball and fish cake flat rice noodle soup and soy-braised chicken with Chinese sausage on steamed jasmine rice are among a series of authentic Cantonese dishes that Cathay Pacific customers are now enjoying inflight as part of the airline’s new ‘Hong Kong Flavours’ dining concept. Launched to celebrate the diversity and vibrancy of the city’s rich gastronomic traditions, Hong Kong Flavours features a variety of signature local specialities available across all cabin classes on long-haul routes from Cathay Pacific’s home hub. 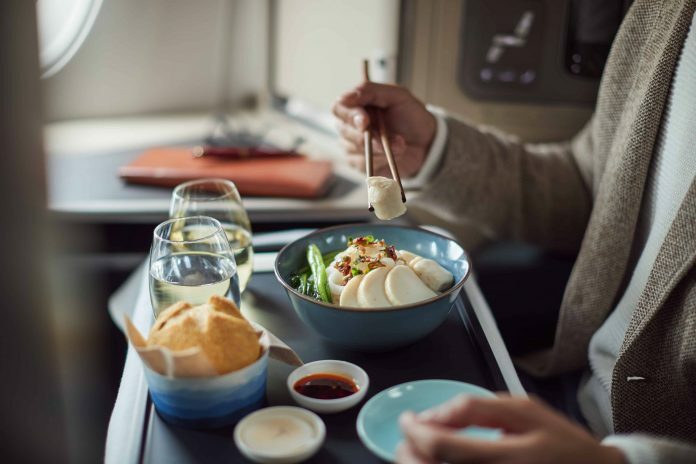 Cathay Pacific General Manager Customer Experience and Design Vivian Lo said that for Hong Kong people, the dishes convey a feeling of home, while also representing a tasty introduction of authentic local flavours for those visiting from abroad. “It’s not an exaggeration to say that people from Hong Kong are crazy about food; and as Hong Kong’s home airline, it is important that our inflight dining reflects our heritage,” she said. “Our new dishes are inspired by those you find in local Hong Kong restaurants. 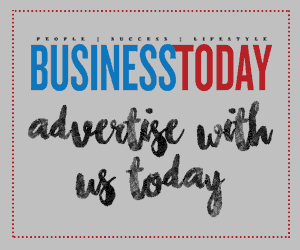 These neighbourhood eateries define Hong Kong’s everyday culinary scene and provide simple yet hearty and delicious dishes for those, like our customers, who are always on the move,” she added. Menu highlights in First Class include braised abalone with flower shiitake and choy sum-layered bean curd, while Business Class passengers can look forward to dishes such as roasted duck with lai fun rice noodles in soup and Hong Kong-style milk tea pudding with tapioca pearls. Passengers in Premium Economy Class have the option of tasting, among other options, steamed halibut with Tai O preserved mustard greens and steamed jasmine rice as well as yin yang fried rice. Meanwhile, dishes served in Economy Class include Hong Kong-style seafood curry rice. Enhancements have also been made to Cathay Pacific’s inflight beverage programme. The airline has partnered with renowned local tea purveyor Fook Ming Tong to present a premium range of Chinese teas, including jasmine, oolong and pu’er, to be rolled out progressively in Economy Class. To celebrate the Year of the Pig, Cathay Pacific will be serving a selection of auspicious dishes over the Chinese New Year period and throughout the rest of February. These special festive offerings include braised garoupa with bean curd and shiitake mushrooms and E fu noodle soup with crab meat sauce. 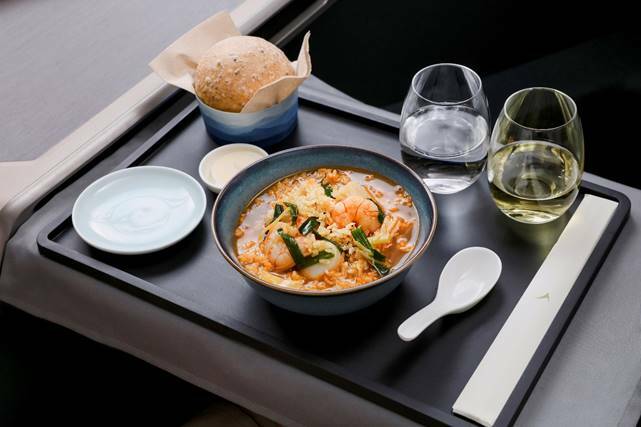 Hong Kong Flavours is Cathay Pacific’s newest inflight dining concept and follows on from the summer launch of the airline’s well-received restaurant-style Business Class service, which is being introduced on all long-haul flights.